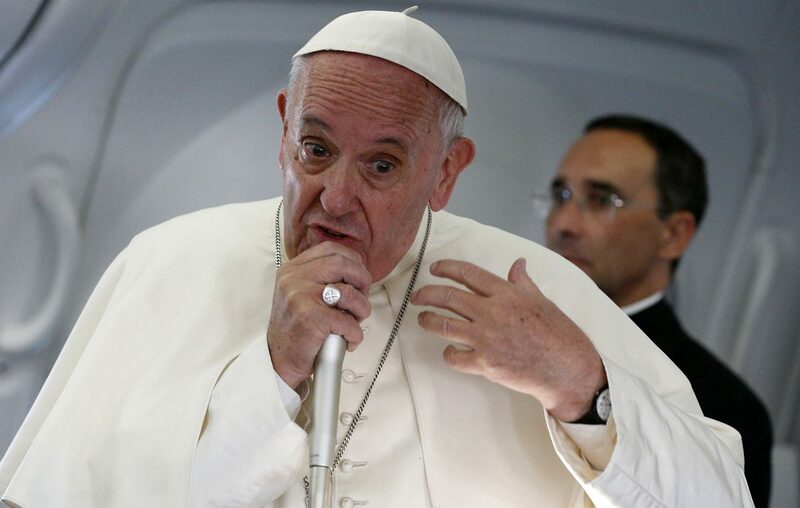 ABOARD THE PAPAL FLIGHT FROM KRAKOW, Poland (CNS) — Speaking to journalists aboard his return flight from Krakow, Poland, July 31, Pope Francis stressed that violence exists in all religions, including Catholicism, and it cannot be pinned to one single religion. “I do not like to speak of Islamic violence because every day when I look through the papers, I see violence here in Italy,” the pope told reporters. “And they are baptized Catholics. There are violent Catholics. If I speak of Islamic violence, I also have to speak of Catholic violence,” he added. The pope’s initial comment came in speaking about the murder July 26 of an elderly priest during Mass in a Catholic church in Saint-Etienne-du-Rouvray, France. Two men, armed with knives, entered the church during Mass. The attackers murdered 85-year-old Father Jacques Hamel, slitting his throat. The Islamic State group later claimed responsibility for the murder.